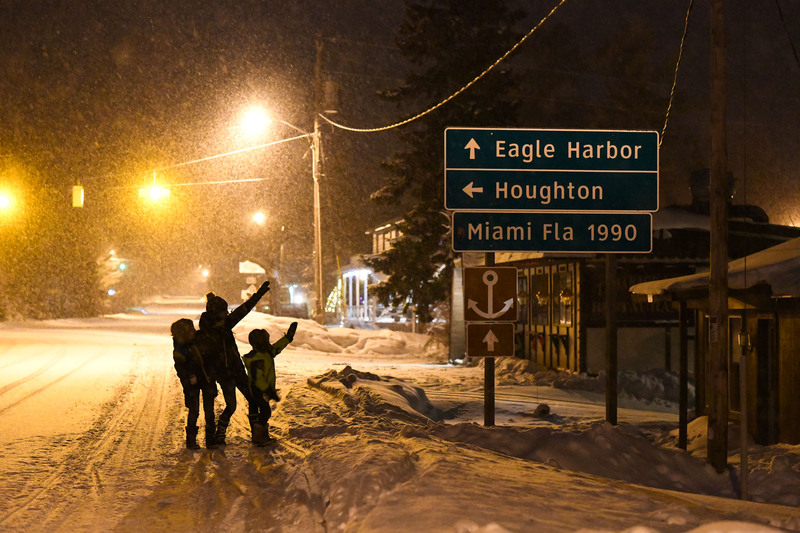 We spent the holidays with my family in Marquette, Michigan, a tiny (and beautiful) little town on the southern shore of Lake Superior. Not Lake Michigan, mind you, Lake Superior. You might need to look it up. Most of you, I suspect, think that this part of Michigan is actually Canada. Nope. In the summer it looks like heaven (white sand beaches for miles), and in the winter it looks like the North Pole. 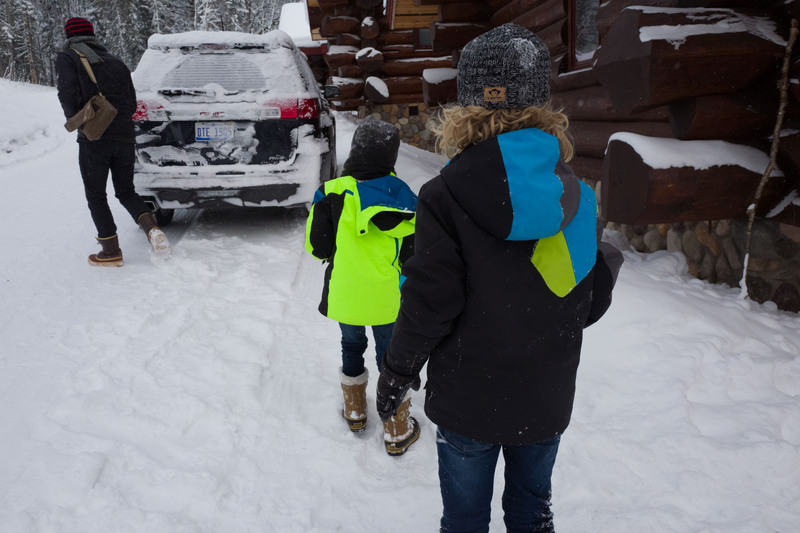 We wanted to continue our tradition of skipping gifts for the boys in lieu of experiences (last year we surprised the boys with a trip to Breckenridge – you can read about that one here), but since we were already traveling, we wanted to find something a little closer to home. 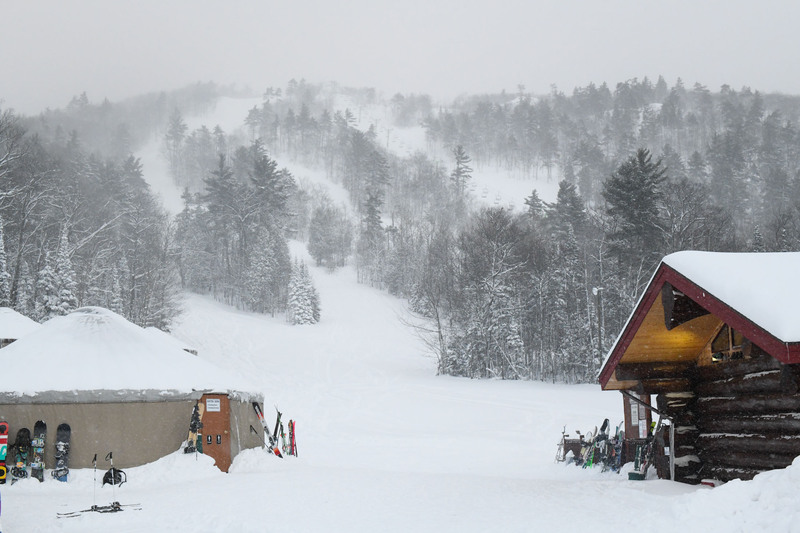 Enter Mount Bohemia, maybe one of the most legit places we’ve ever skiied, only a few hours from my hometown. Mount Bohemia is located at the very tip of the Keewenaw Peninsula, the Northernmost point of Michigan (including that part that looks like Canada), and it’s surrounded by water on three sides. 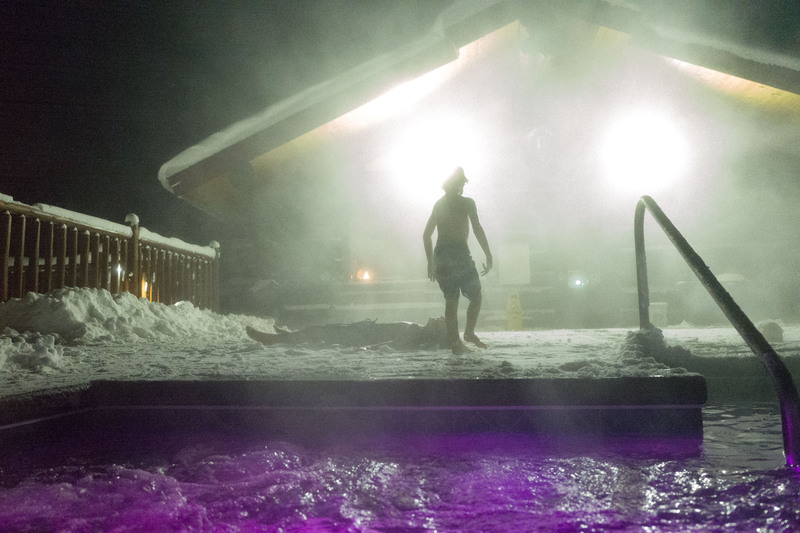 It gets insane amounts of snow – so much snow, in fact, that this is one of the few ski resorts that never makes it’s own snow – the snow is 100% natural. 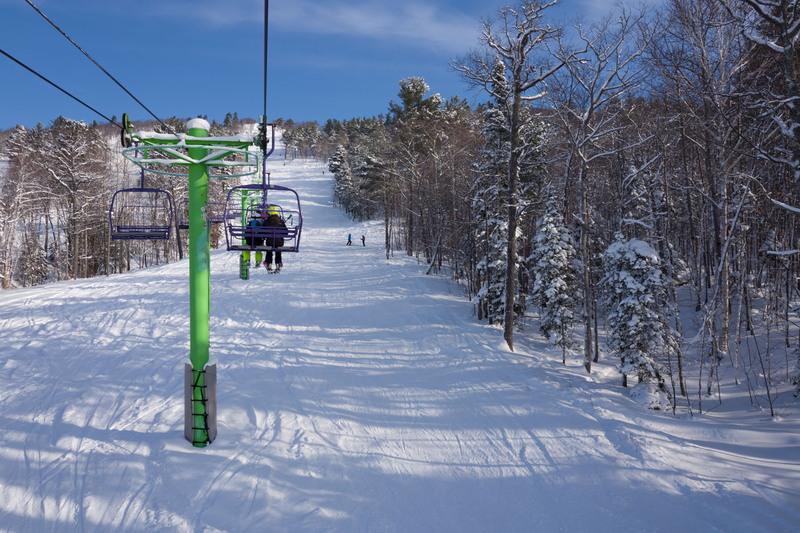 And the entire resort is ungroomed! 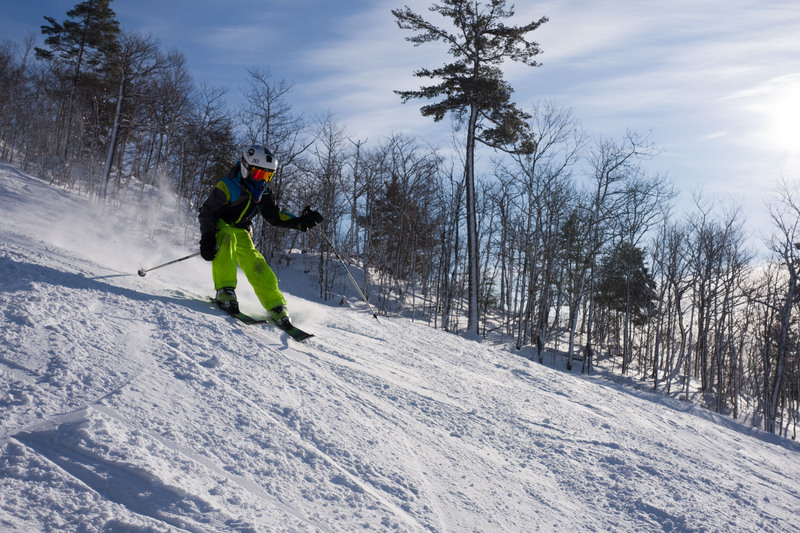 Which means that even the lone intermediate (blue) run is like a natural terrain park, filled with moguls and jumps, and the odd rock or log to ski around. 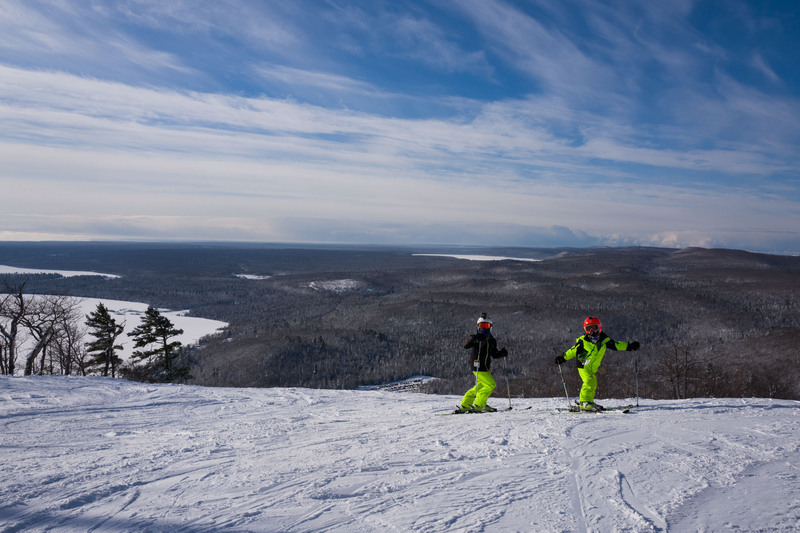 Bohemia is, in fact, a place for mostly expert skiiers – the vast majority of runs are double-black or triple-black diamond, through trees, and over cliffs – which makes it a perfect place to take a 7 year old! 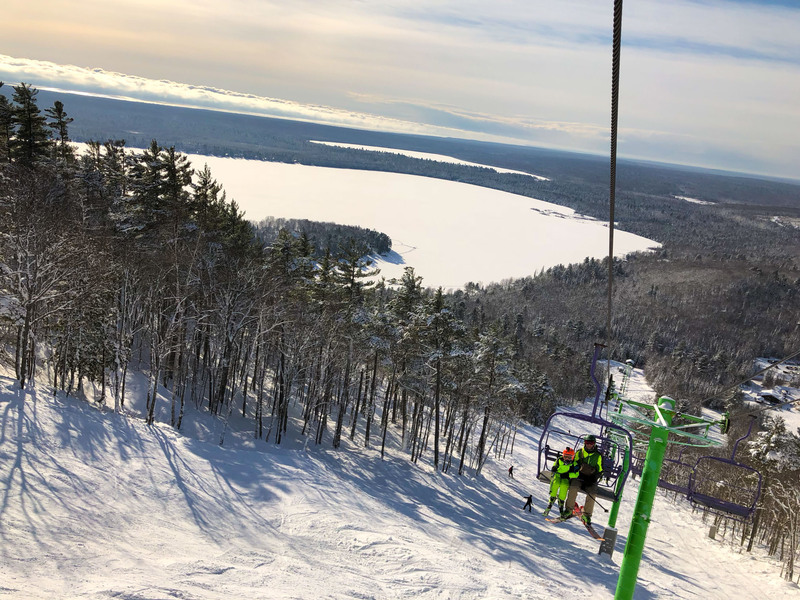 Both of my boys are really good skiiers – they’re in their third year of the Blue Mountain Mountaineer program (a feeder program for the race team) – so really, the only weak link is….me. Gulp. The other reason we fell hard for Mount Bohemia is because the vibe is….so freaking cool and unique. And….like I said before, legit. 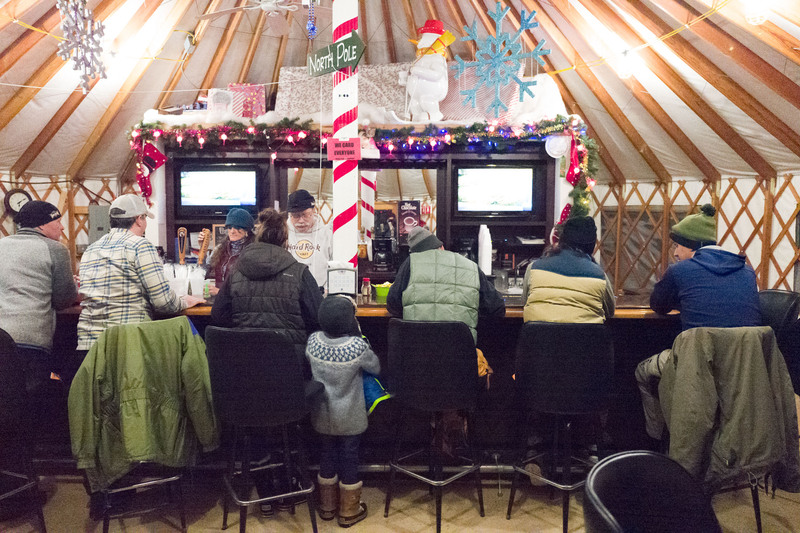 The “resort” is a series of heated yurts where you can rent skis, get food, and, obviously, one is a bar. 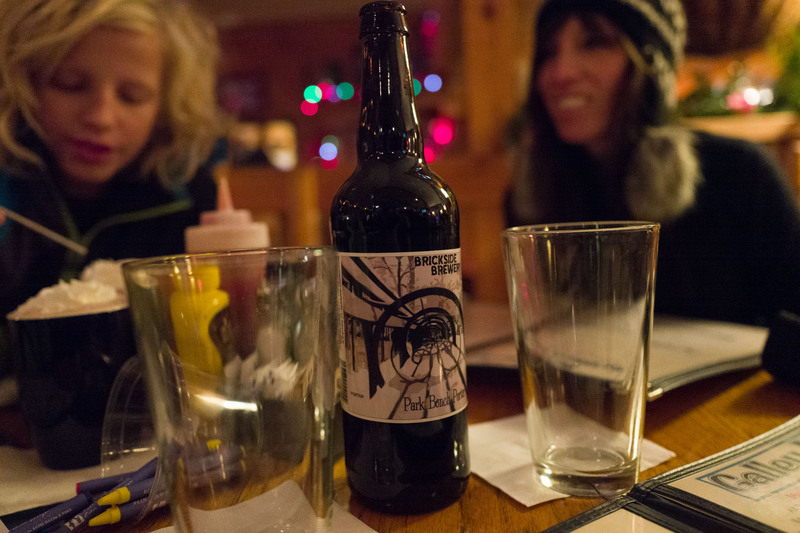 (It’s the U.P., yo, of course there’s a bar). In fact, there’s two. 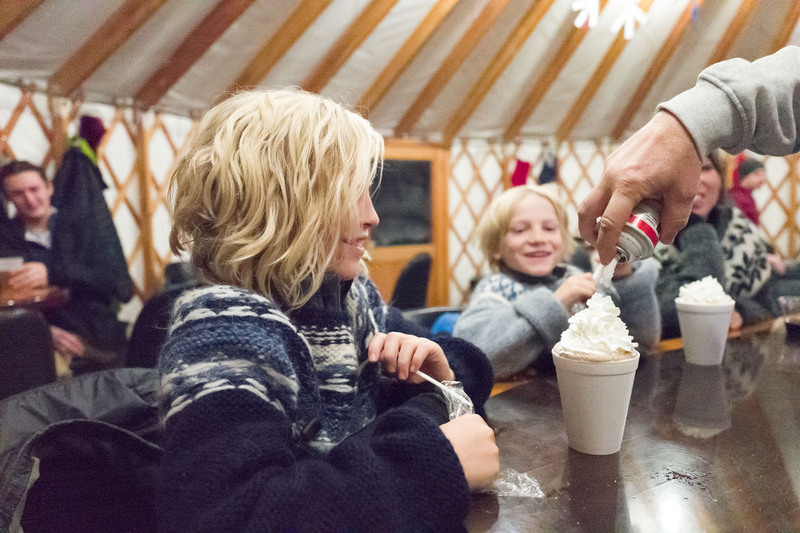 Located across the parking lot from the yurts is a little log cabin which contains a cozy bar serving up some amazing gelato, top-shelf booze, with a sauna (pronounced “sow-na” you animals) and a giant outdoor hot tub, which stays hot even in -16F. 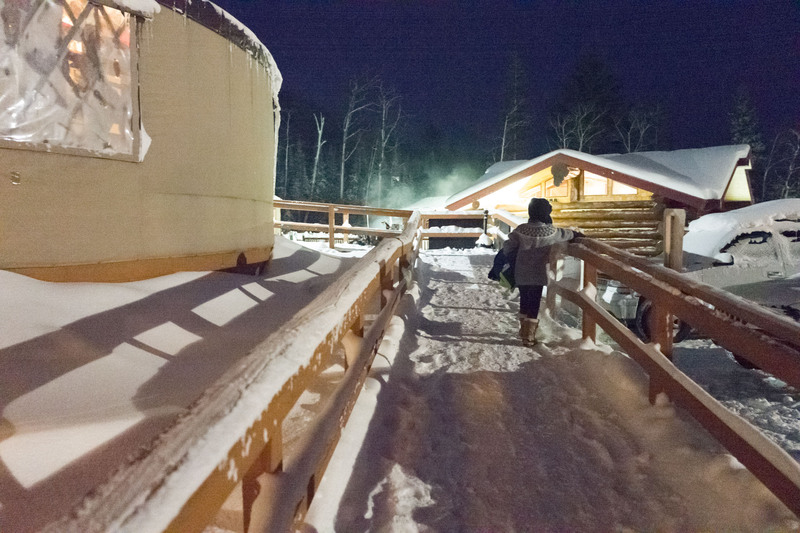 Big groups can stay in the yurts right next to the ski area, but we loved the log cabins, located a half mile or so down the road. 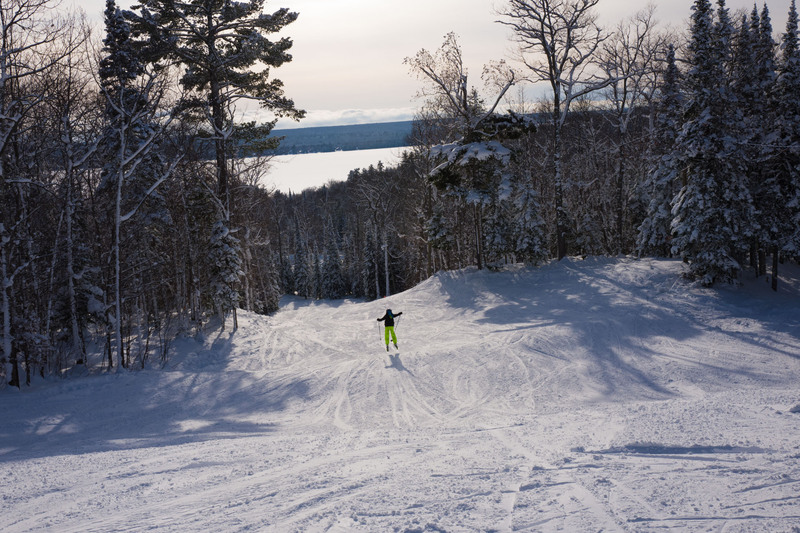 You’ll need to drive to the resort (it’s not walkable in – no joke – below zero temps) but totally worth it. Just bring a 4WD vehicle. 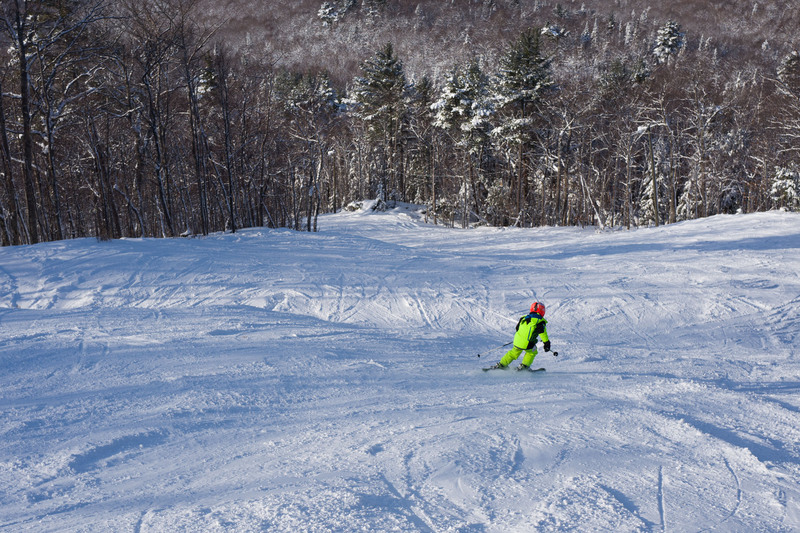 Lastly, Mount Bohemia runs day trips to nearby Voodoo mountain, one of the few places to go Cat skiing. You bet we signed up. It turned out to be quite the adventure, but I’ll save that for a later post. 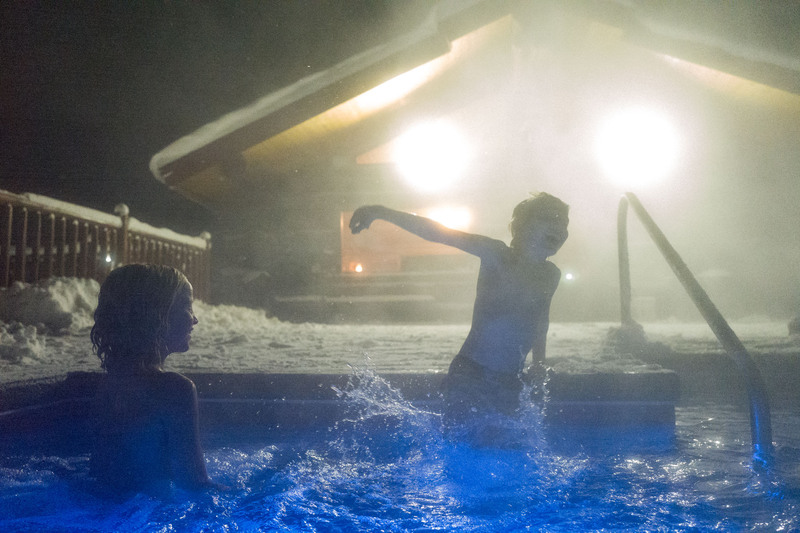 In any case, our three nights at Mount Bohemia was so much more than we bargained for….in the best possible way. Even if you aren’t based in the Midwest, it’s totally worth a trip. One could fly into nearby Houghton, MI and then drive to Bohemia, but I’m a Marquette girl. Fly into Marquette, stay a night or two there (I like the Landmark for hotels, this place for AirBnb), then drive up to Bohemia. Stop for a pasty (with ketchup!!) 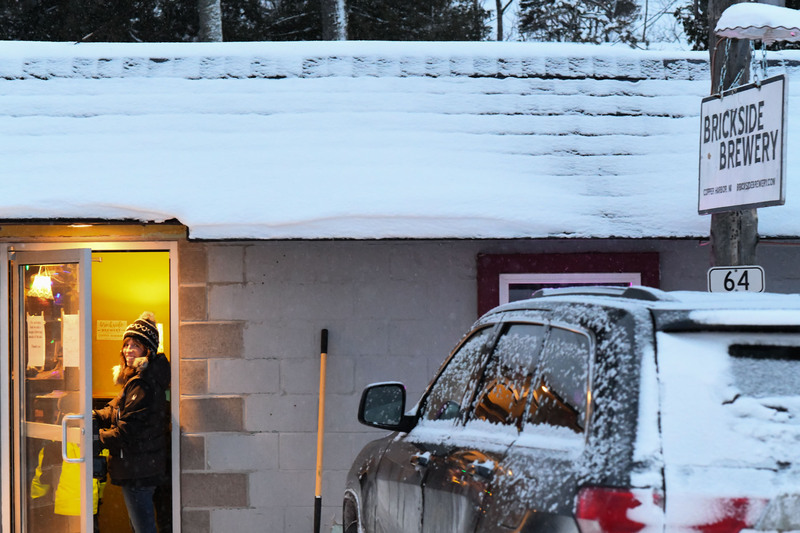 before you leave town (Jean K’s are my favs – or you can hit Lawry’s in Ishpeming if you forget to stop in Mqt), and make sure you have plenty of time. From Marquette it’s a 3-4 hour drive depending on the weather, but I’ve never once driven to the Copper Country, in the winter, without encountering a massive snow storm. So there you go. I highly recommend stopping for soups and salads at Cafe Rosetta in Calumet. 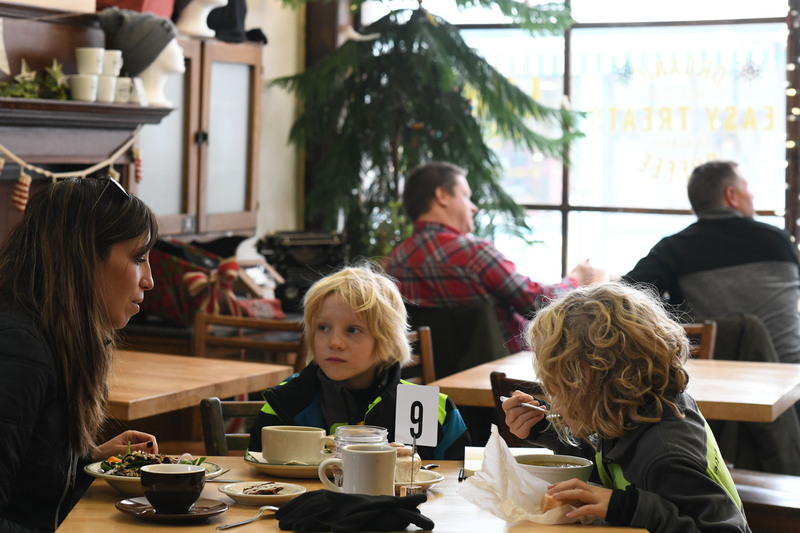 It’s close to Mount Bohemia, charming and cozy, and the food is delicious. 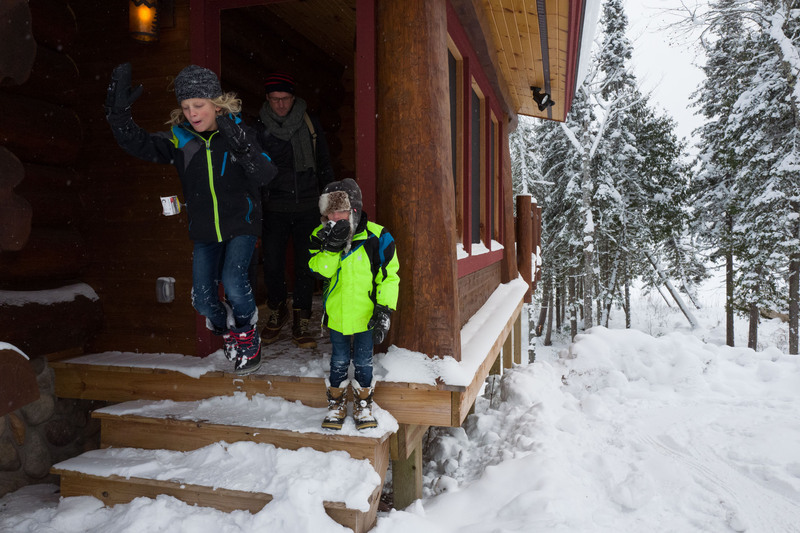 As I mentioned, we loved staying in the log cabins at Mount Bohemia. They’re nothing fancy, but the surroundings are so insanely gorgeous we really couldn’t have found a more idyllic spot. 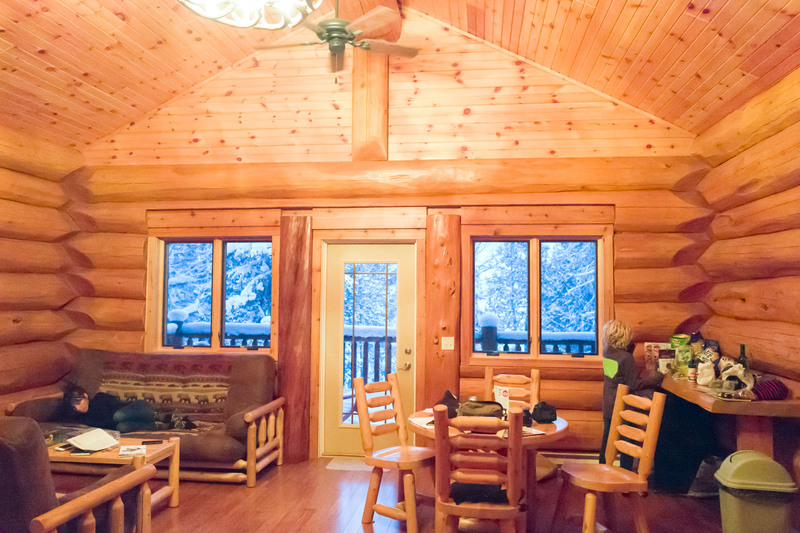 No TV, spotty-to-nonexistant wireless and just a mini fridge, so plan on having actual meals at the lodge. We brought a ton of snacks, however, and were fine. We arrived just in time for dinner that first night. 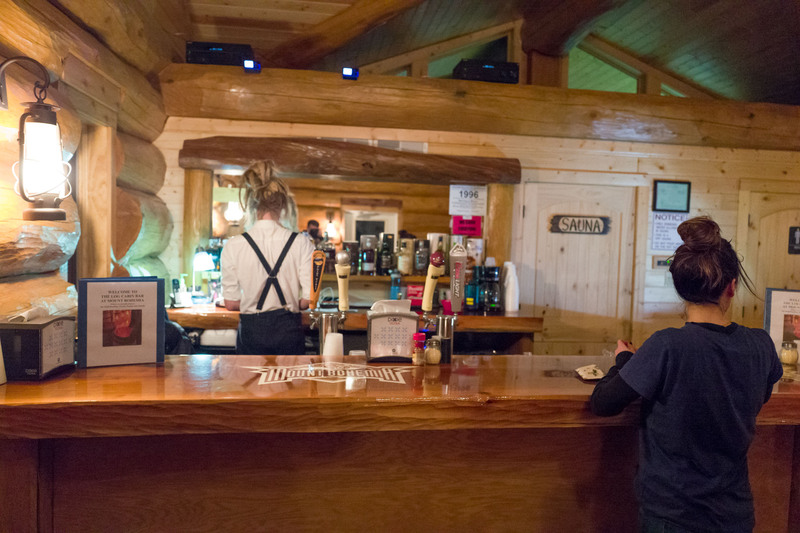 Breakfast and dinner are both included with lodging and the food is basic, but decent. There was pulled pork, a taco night, and pancakes and sausage every morning for breakfast. Of course, if you don’t want the included dinner, you can always purchase a pizza (they have a wood-fired pizza oven on site). 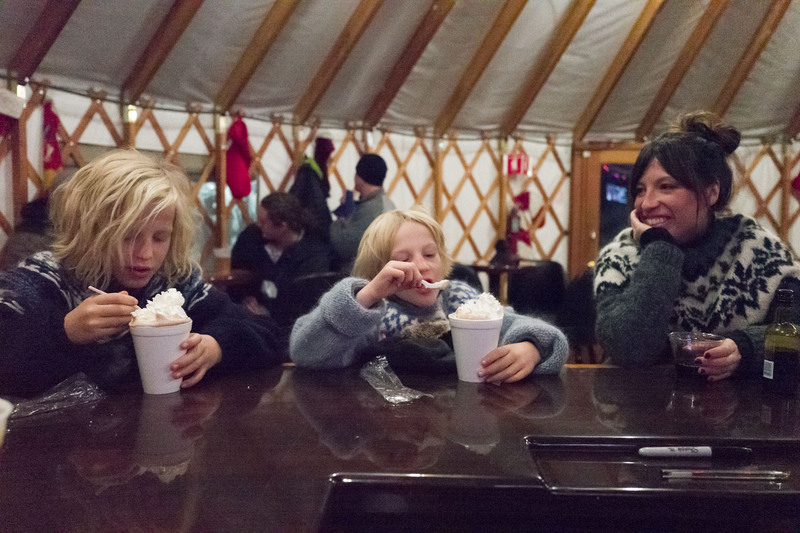 My kids were big on the hot chocolate at the bar – Rick was heavy handed with the whip cream, much to their delight. 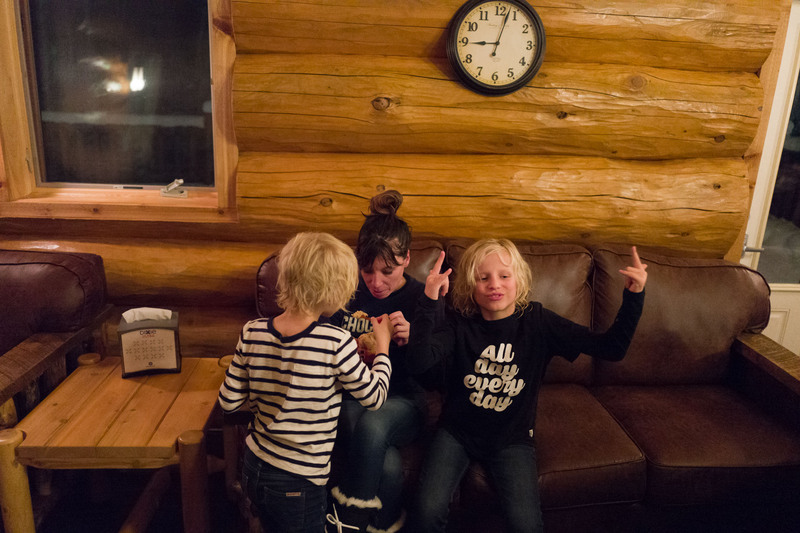 We ended every night (and I do mean every night) at the log cabin bar. 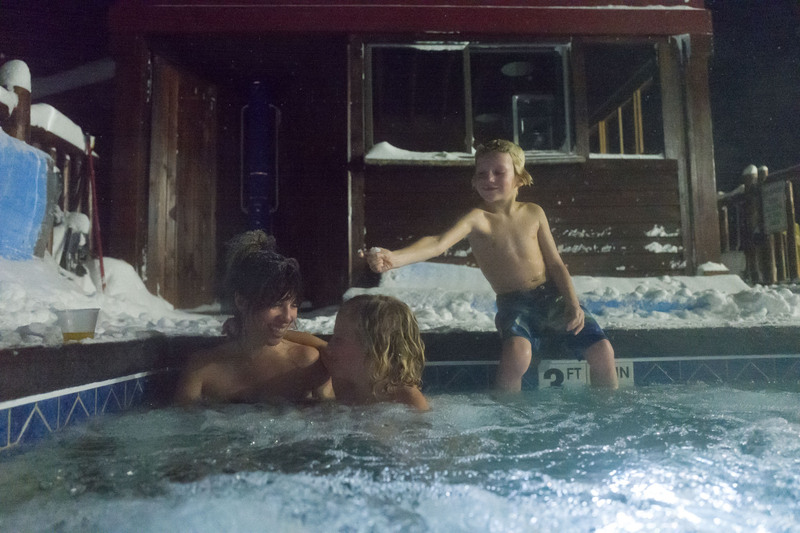 Gelato for the kids, Scotch or Bourbon for Mike and I, and a hot tub. It. Was. Glorious. You’ve also gotta love a bar where the patrons are in a mix of Sorel boots and swimsuits. Just sayin. C’mon girl. 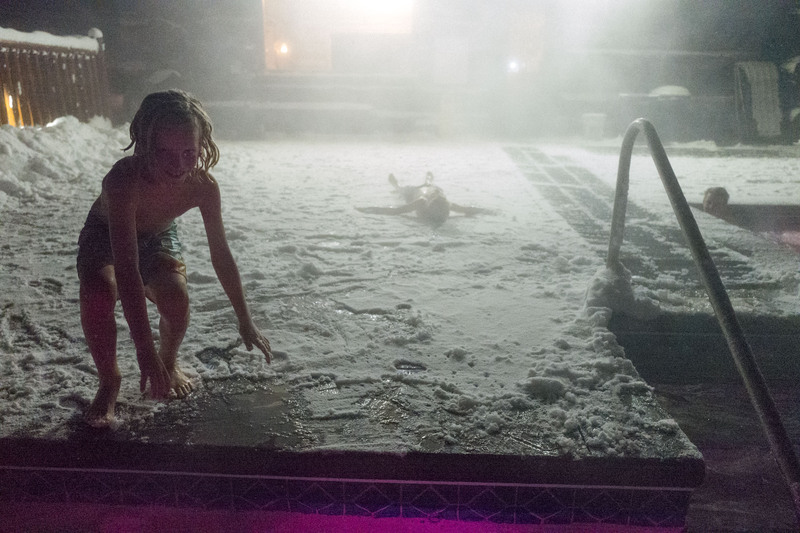 It’s only -16 out there…. 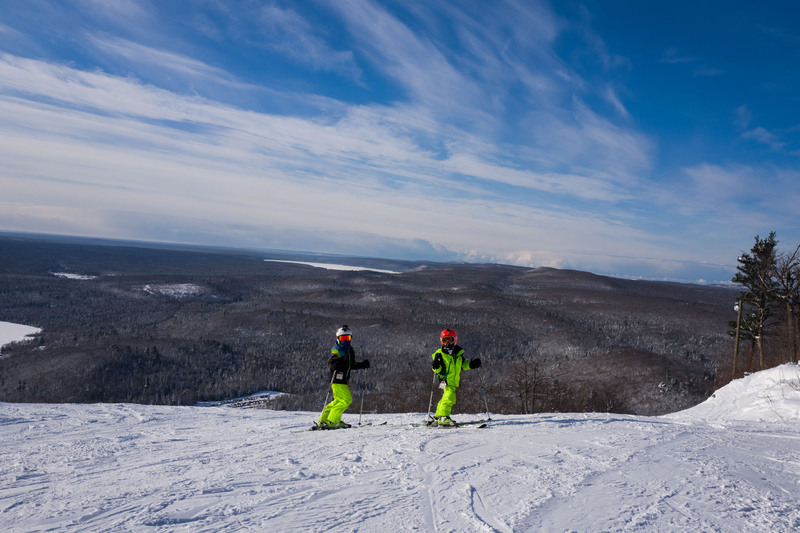 Thus begins our ‘Boys Are Lunatics’ photo series…..
We were lucky enough to get a bluebird day on our last day at Bohemia. Given the terrain, I appreciated the visibility. Despite the fact there were only two runs I personally was comfortable on, the runs were SO FREAKING FUN that the boys were wiling to do them over and over again. Mike, especially, is itching to go back and hit some of the trickier, tree-lined, cliff hucking runs. Next time. 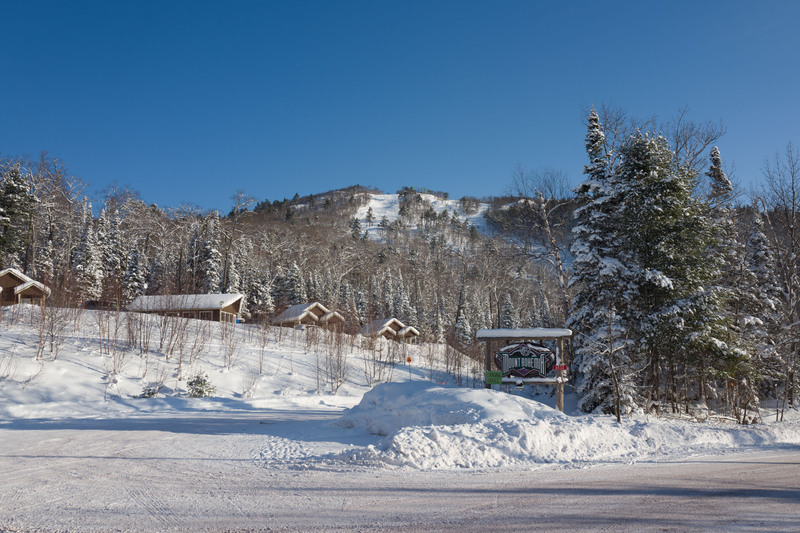 The Copper Country is beautiful, and there’s a ton of cross-country skiing opportunities, snowmobiling, etc. We took an afternoon and drove up to the very tip of the peninsula, Copper Harbor. 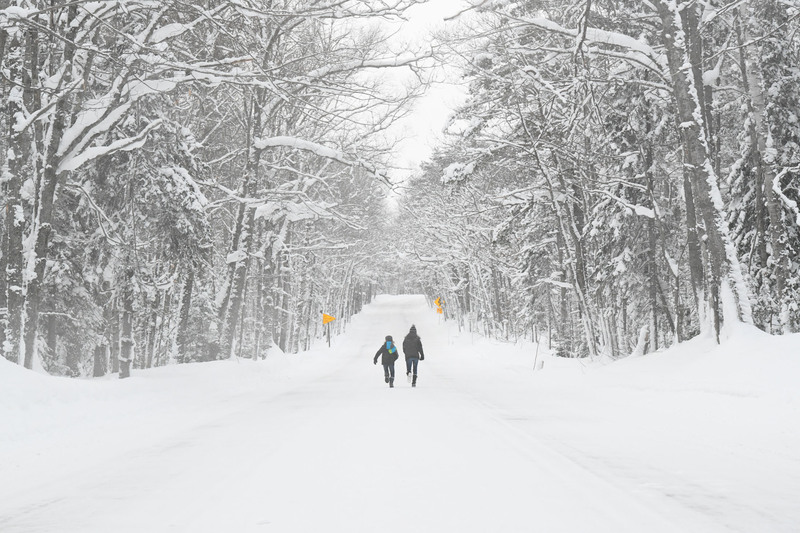 That far north, in the winter, even the drive feels like an adventure. This is the actual road (I mean highway) you’ll take from Bohemia to Copper Harbor. We had to get out and do a quick run-n-slide. 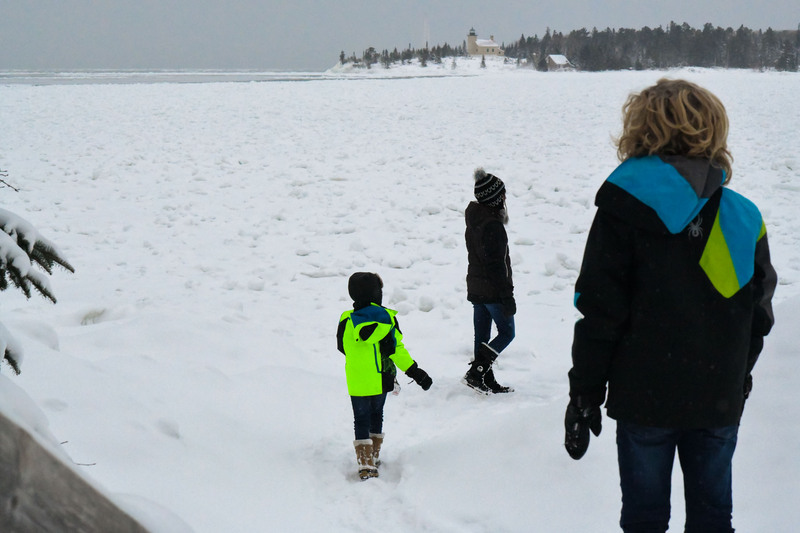 Once in Copper Harbor, we explored around the lake (I’m sure someone will lecture me on walking on the ice yadda yadda I grew up here, peeps, I got this), and grabbed dinner at The Mariner. 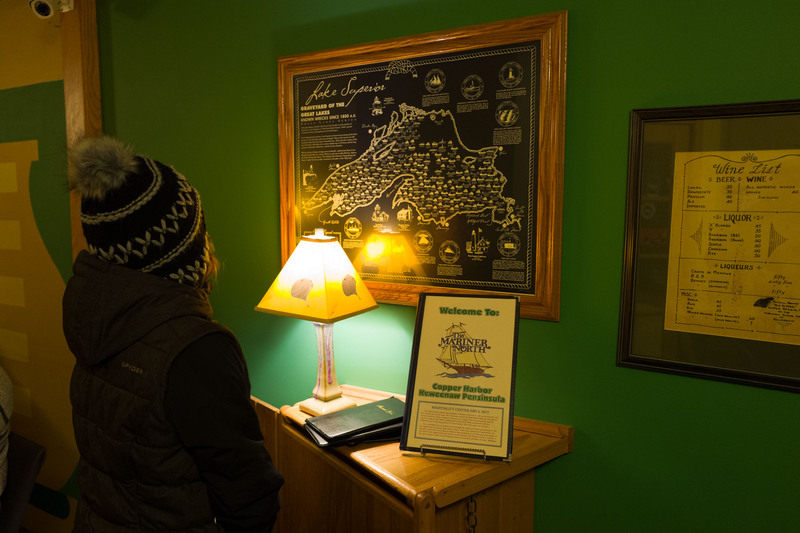 They have local beer from Brickside Brewery, to-die-for whitefish fresh from the lake, and a cool poster of alllll of the shipwrecks on Lake Superior that totally wowed my little guys. Fun fact: Brickside Brewery is just down the street, and if you’re just in the mood for a drink (or want something even more low-key than The Mariner) you can always do take-out and bring it into the Brewery. Us Yoopers, man. We crack ourselves up. For more info on Mount Bohemia, you can visit their website, here. 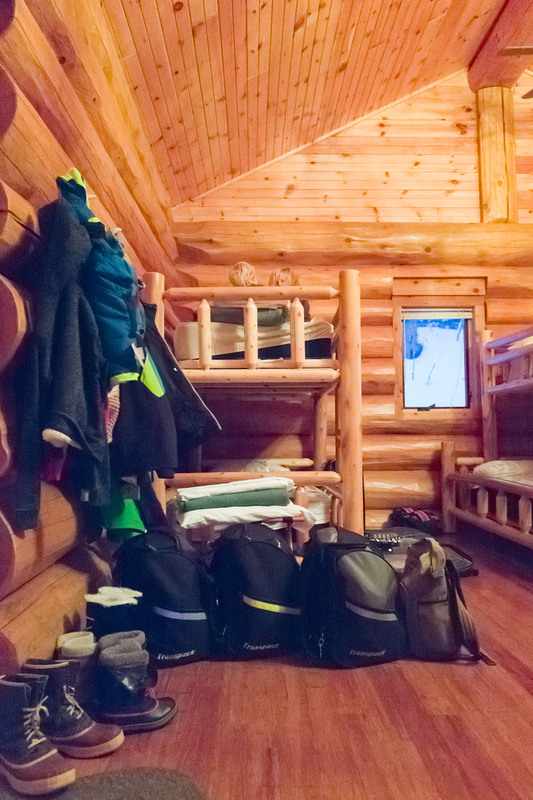 Signing up for lodging and cat skiing is a little confusing online, but if you call, they’ll totally help you out. And if you want to see more pics of the extreme terrain, check out Power Mag’s coverage from a few years back, this New York Times article, or – whoa – this article on lakesuperior.com. That lead-in photo pretty much sums it up. 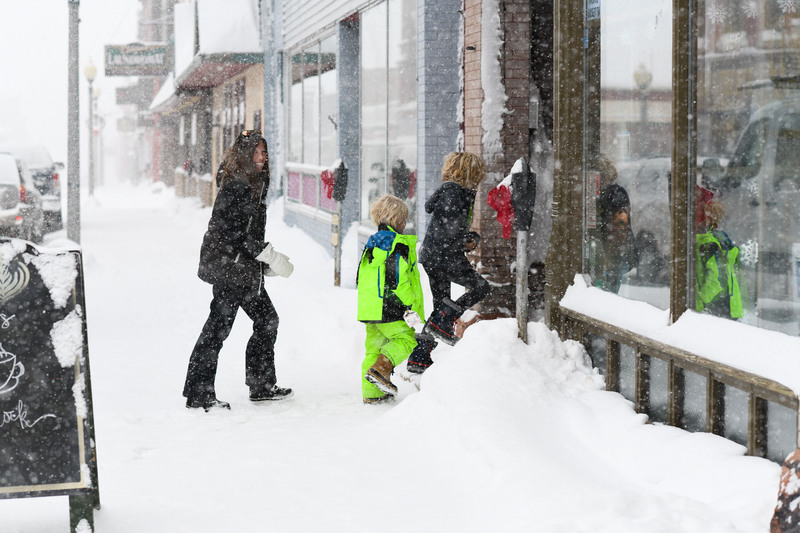 We recently moved from Denver to near Menominee-Marinette, WI and are excited to do more exploring of the UP! Thanks for the inside tips! This. Looks. Amazing. And I don’t even ski!!! What an incredible experience for your boys! And you, too!!! Any info on the swimsuit? 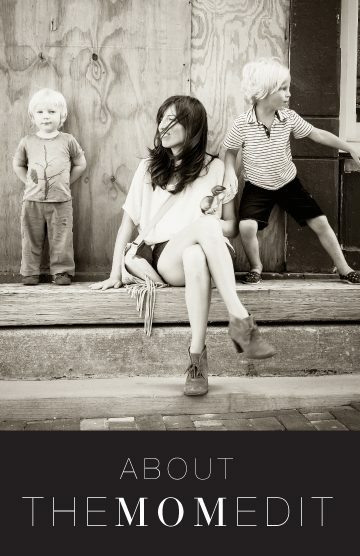 Love all the photos, AMAZING! Thanks for sharing your experience with us! Wow, what a gem of a place. 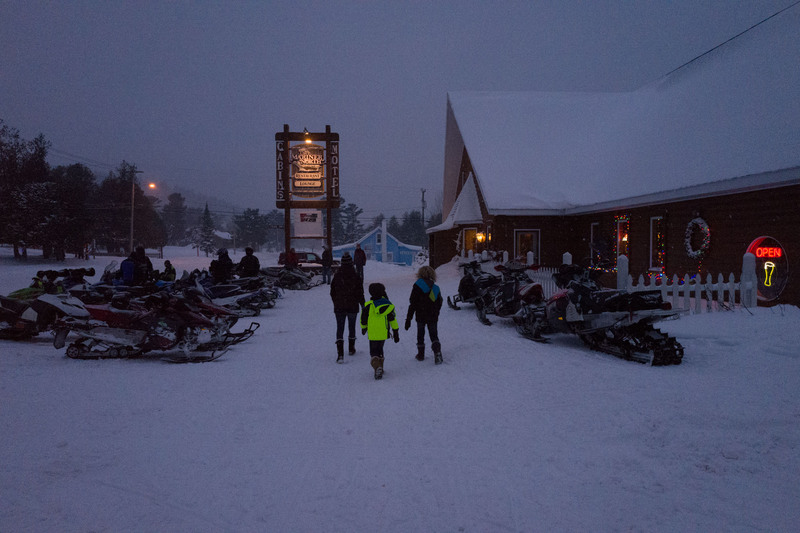 Love the photo of all the snowmobiles in the parking lot. 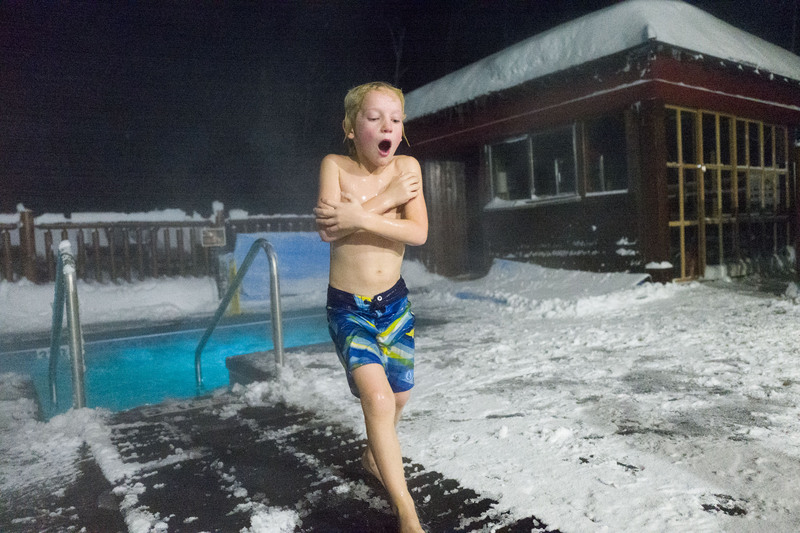 My inner Yooper is so excited to see this story! 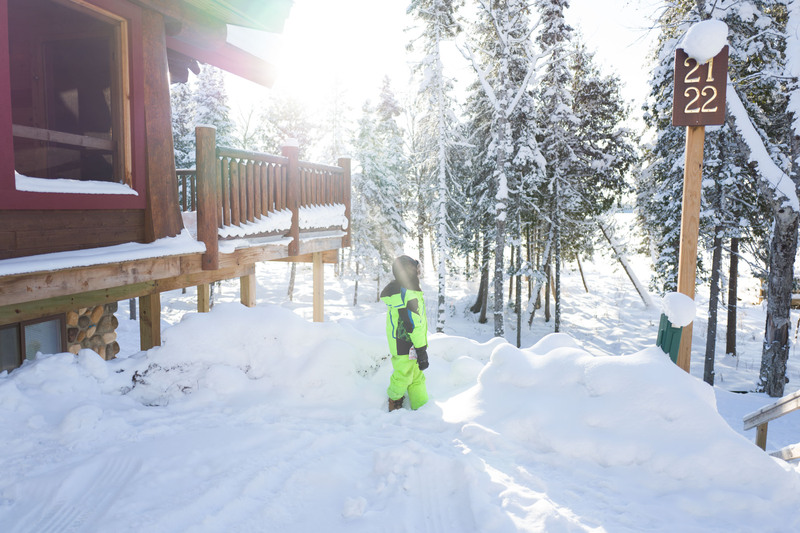 We love bringing our boys back to the UP every winter and summer to experience the magic we had growing up. Lord knows it’s a stark contrast to our lives in Raleigh! I feel like the UP is one of the most unique places around. This makes me want to make the trek from SE MI and I don’t even ski! Cannot believe you were there. The ONE day I was not at Rosetta, clearly. (Even if I didn’t work there, I would eat there every day. Usually do, ha.) 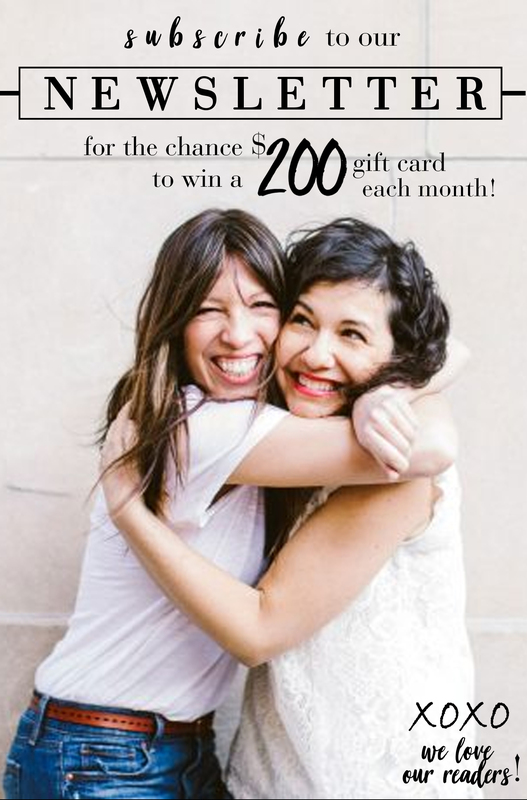 I would have loved to tell you how much inspiration I have gleaned from your blog over the past too many years! Glad you enjoyed your adventure!